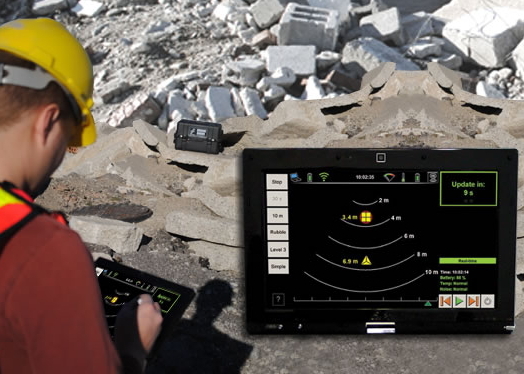 Ground Penetrating Radar or GPR only requires access to one side of the structure being tested (unlike the old concrete x-ray technology) as radar has the transmitter and receiver in one unit and relies on the reflection of radio waves to produce a meaningful image. Our unit can scan large areas of concrete in one or more scrolling images producing a vertical sectional view of the test area. These images can be placed together to form a virtual 3D model. GPR can provide advance warning of subsurface features. It is a non-destructive concrete testing and non invasive service to scan in and under sub-surface areas like a concrete slab. The information gathered will allow the safe drilling, coring and cutting of concrete to take place so that no down time is recorded nor unnecessary injuries and loss of life. Success in the mining and quarrying industry greatly depends on the type and structure of rock surfaces both on and below the ground. Rocks on the ground surface can easily be analysed without complex procedures but rocks below the surface are not easy to deal with, which is where ground penetrating radar becomes useful. The pulses are reflected off major structures including faults, joints and even fractures. This way, geologists can acquaint themselves with the stability, distribution and other features of the underlying rocks. In mineral exploration, Ground Penetrating Radar is used to detect and track mineral veins and to identify and track the major fault lines (which must be handled with care for the safety of miners.) This method is mostly used for detecting deposits of diamond, iron, titanium and gold. It is also useful in the construction industry where it is used in the extraction of rocks. It should be remembered that there are specific type soft rock that are suitable for construction, and before quarrying starts, it must be proven that they exist below the ground. Some of the rocks normally extracted this way include limestone, marble and granite. The scanning machine can even detect rock structures and cracks that may reduce the quality of the rocks to be quarried. The detection of groundwater is another useful potential application. GPR is capable of defining the underground structures and even identifying anomalies, which is very useful in ground water detection and analysis. In fact, very few technologies are available that can be used to analyse the chemical composition and content of the underground water. Before the construction of roads or railway lines, the surface below the ground must be examined to help the engineers select the best (read safe and inexpensive) route to follow. One of the best things, is that its images are extremely high resolution. It is this feature that makes it suitable for determining bedrock depth, locating groundwater channels, identifying karstic features among other uses that require high resolution imaging. The same feature makes it useful for investigations in hydrogeology; investigations that include delineation of the water table as well as borehole monitoring (useful for investigating contamination inflows). In a large farm, scanning equipment can be useful for mapping buried infrastructure which may include pipes and foundations of old buildings. In every city and major towns, there are numerous pipes and cables that were laid down in the past. Some of these pipes and cables were rightly planned while some of them were haphazardly laid down. Whatever the case, there comes a time when these underground structures need to be mapped, and there is no better technology for doing it than using one of the new concrete scanning machines. 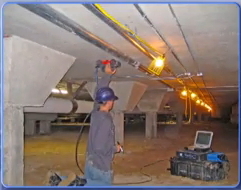 GPR has a huge advantage over metal detectors since the former can even detect non-metallic materials. Thus, say, before an excavation is carried out in an area believed to have a complex range of subsurface cables and pipes we scan to identify what exactly lies below the surface. For sure, there are other cable detecting devices that can be used for this service, but their disadvantage is that they can only locate current-carrying cables. This makes the convention cable detection methods unsuitable for locating pipes made from materials such as asbestos or plastic. Another advantage is that its signals can be timed and the travel time used to approximate the depths of the pipes. This makes this a very useful technology, now that all construction sites must be mapped for underground utility structures. Without this mapping, it can be very costly and time consuming to complete a construction project. 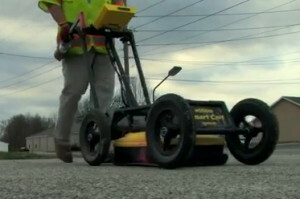 The ability of GPR to detect buried objects of different materials obviously makes it a useful tool for forensic teams. 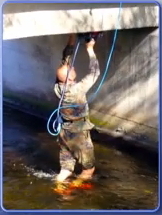 It can be used to detect buried drugs, weapons and even money. In fact, it can even be used to locate buried corpses. It should be noted, however, that the application does not deliver the fantastic results as the mass media would have their consumers believe. Watching crime TV shows, one would be forgiven for believing that radar is a miracle working technology that can be used to solve hard-to-crack cases. However, it is really useful for detecting subsurface objects that can come in handy as evidence during court cases. In archeology, the use of scanning equipment is useful when searching for buried artefacts and when mapping large grounds of historical sites. In fact, this type of radar is even useful for detecting small changes in soil structures beneath the ground. Archeologists prefer radar because it does not change the structures of these objects. The military, which is well known for their love for useful technology, has not been left behind in the adoption of this type of radar technology. Military personnel use GPR to locate and detect buried explosives. Whether the explosives are buried in rocks, or soil, we can locate and detect them. Unexploded ordinance, known in military parlance as UXO, can be very dangerous when unearthed by non-experts, and even the experts need to map their precise location before disarming them. Recently, security personnel have started using radar services to locate improvised explosive devices. The military is not alone in using this technology for security-related purposes; even industrial security consultants and emergency first responders find this technology useful. It is useful in locating victims of collapsed buildings who may be buried as a result of, say, landslide. In these cases, the results can literally mean the difference between life and death. Our concrete scanning machinery has several uses, and many others are being identified. Suffice is to say that the technology can be useful in any situation where an object beneath the earth’s surface needs to be detected.